Fabulous Brights, Lots of Prosecco and Big Love at Houchins! The happy couple had obviously put a lot of thought into the details, with the guests arriving through the gates at Houchins being greeted with this fantastic chalk board. Rob and I both stood there and read every bit of it, it was so lovely! 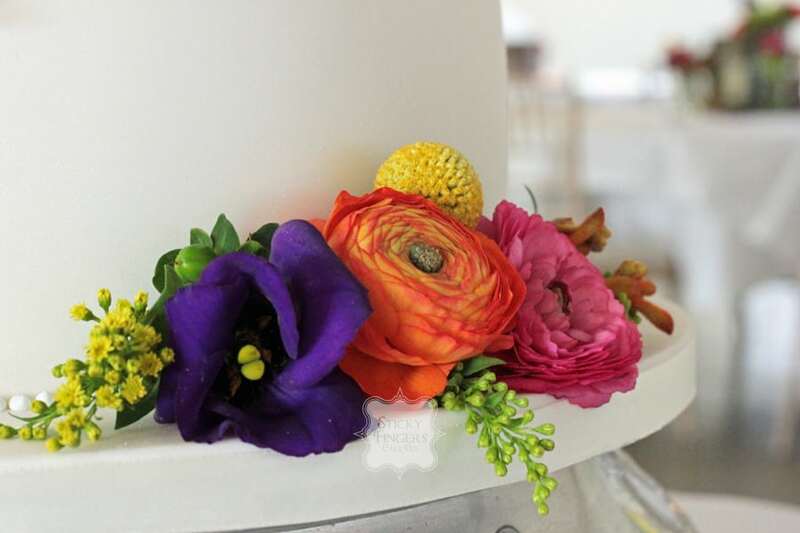 I love Faith’s floral skills, she’s so talented – look at these buttonholes; they’re perfect! The venue was also decorated with the biggest, brightest balloons I have ever seen! Rob got this fab shot from the mezzanine level, looking down into the main dining area also showing all the twinkly lights and (lots and lots!) of empty bottles really finishing the area off beautifully. And so onto the cake! Louise and Will chose to have a plain, white iced 3 tier wedding cake, which I sprayed with edible pearl lustre, just to give it a bit of a shimmer, with piped royal iced pearl dots to finish it off. I then decorated it with fresh flowers. Sometimes I think less is more and definitely so in this case as the brightness of the flowers just made the cake absolutely perfect. The flavours they chose were Red Velvet, White Chocolate and Passion Fruit and Traditional (but not too traditional!) Fruitcake, which, I understand, was being taken home! It was an absolute pleasure working with everyone on this wedding and as always, great to be at Houchins www.houchins.co.uk Looking forward to returning again in July!